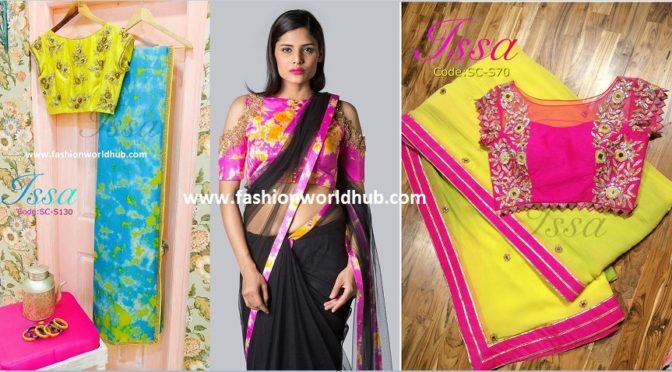 Trending these days are lite weight designer sarees with heavy designer blouses. These days trending girls are more preferring designer sarees than the pattu sarees for engagement and receptions. 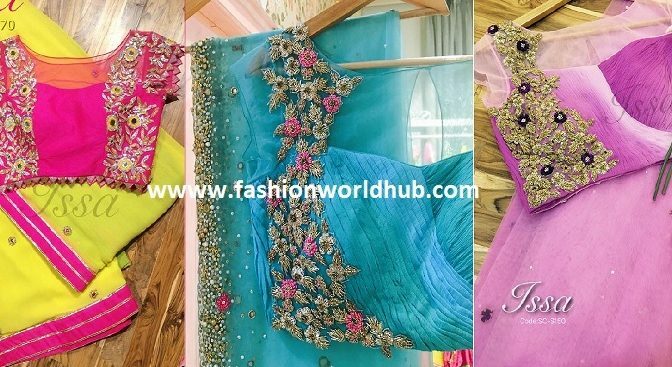 Now a days our fashion designers are customizing the sarees as per the requirement of customers. 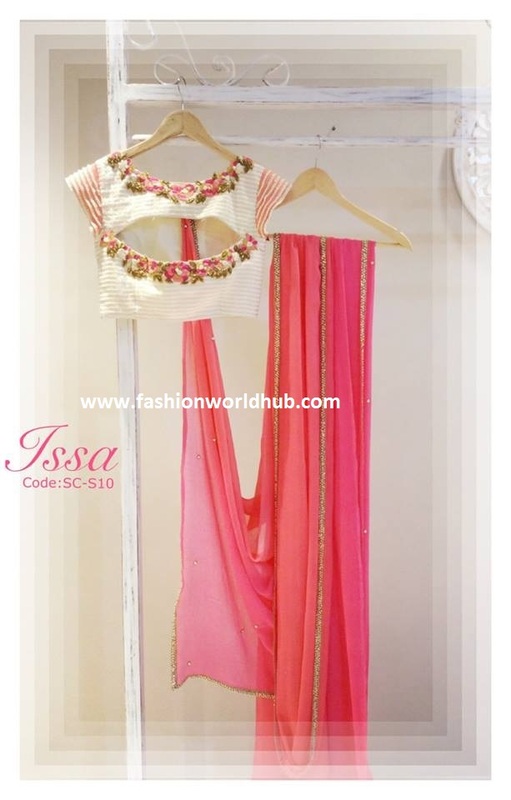 Their are lot of fashion boutique stores in hyderabad out of which the upcoming boutique is ISSA Studio which is located at heart of the IT hub hyderabad! Organza sarees are trending these days and when it is paired with designer blouse then the saree look more outstanding. look at the beautiful Sea green and yellow organza saree with beautiful pearl and zardosi detailing. Look at the beautiful saree. This saree set features a shaded powder blue and sea green net saree with cut work border around the hem and bootis scattered all over. It is paired with chiffon patterned blouse and intricate hand embroidery.. 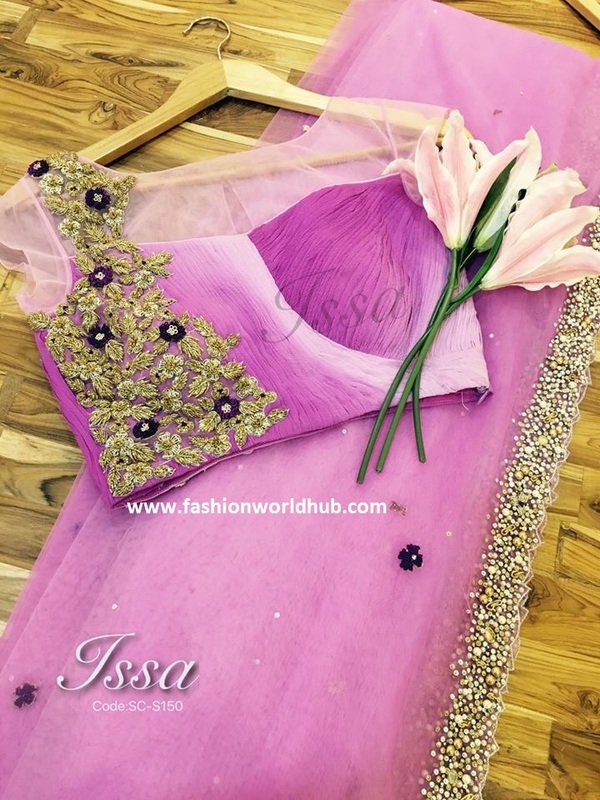 Lavender and purple shaded net saree with a beautiful cut work border around the hem and bootis scattered all over the border with designer patterned blouse and hand embroidery at one side of the blose with a boat neck blouse with net sleeves. Awesome colour combination. 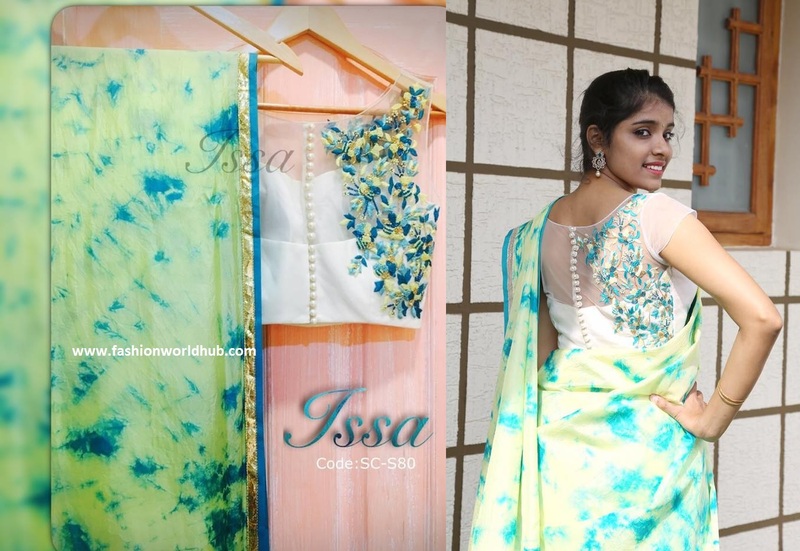 Powder yellow, turquoise blue tie dye saree with embroidered white blouse teamed with back button blouse. Issa studio make the designs fab which matching to the current trending market! 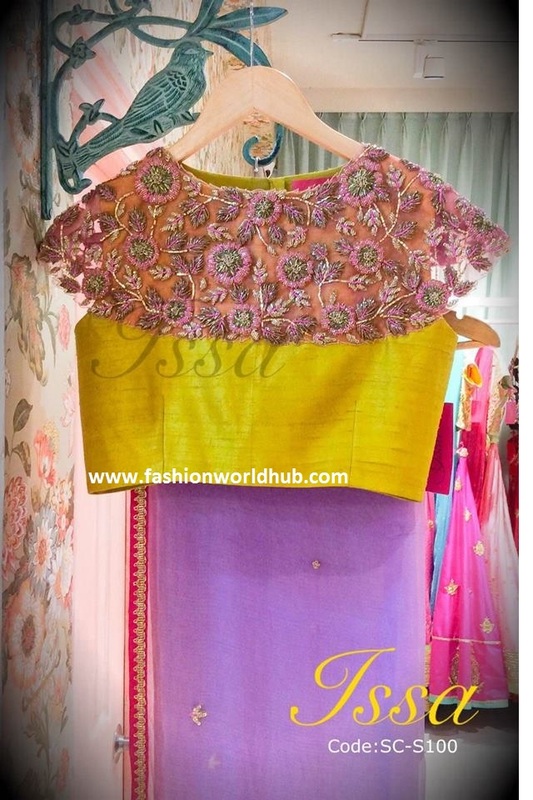 Lavender saree with yellow shoulder patterened blouse. The bunch floral zardosi contrast colour work on the blouse specifically on the shoulder made the blouse more elegant and attractive. Previous PostHappy Wedding Anniversary to Allu Arjun and Sneha Reddy! Watch the couple wedding video!Next PostLatest Uncut Diamond Kasulaperu. Contact number already available. kindly reach them. with finishing blouse. method of payment. contact details are already available. Plz can u give contact no.. Need ur contact no pls share me..
Nice sarees.Let me know the price of saree with code Sc-S10. Very nyc..hw to buy it.. Contact numbers are available in the link. kindly call the given number. contact number available inside link.